Modelling real-world physical systems always includes uncertainties (at least implicitly) regarding the measurement and determination of the data of the model. This for instance involves material properties, loading and also domains. We are concerned with infinite dimensional space dependent systems which are described by PDE. Typical applications are the simulation of mechanical systems and of groundwater flow in porous media. Since the solutions directly depend on the data, the measurement of this dependence in probabilistic terms is required in order to asses the reliability of the calculated solution. By this, it becomes feasible to deduce and quantify the solution uncertainty depending on data uncertainties. Illustration of forward propagation of uncertainties and inverse parameter identification. The numerical treatment of these problems usually requires a computational effort which is significantly larger than for deterministic problems and which may easily become intractable. Thus, the development and analysis of efficient model reduction techniques for the numerical evaluation is important to enable the treatment of relevant applications. Depending on the data model, we employ modern sampling methods (multilevel Monte-Carlo) as well as projection methods based on the polynomial chaos (stochastic collocation and stochastic FEM). The evaluation of forward or inverse stochastic problems often can be accellerated significantly (in terms of convergence rates) by employing functional representations. Moreover, such a representation allows for a numerical analysis, which resembles and extends concepts known from deterministic PDEs. With discretizations in generalized polynomial chaos as e.g. used for stochastic Galerkin methods, (reliable) a posteriori error estimates can be computed. These iteratively lead to problem-adapted solution spaces with optimal convergence. Since the discrete algebraic systems exhibit a high dimensionality, model reduction techniques are often inevitable. Apart from the adaptation of the discrete space, we employ modern hierarchical tensor methods for the compression of the operators and the parametric solutions. This is tightly related to a possible representation as low-rank manifold. The tensor train (TT) format has proven advantageous for this. Applications for the developed methods can e.g. be found with sampling-free Bayesian inversion, topology optimization under uncertainties, and the determination of effective material models in case of media with multiscale properties. Mesh adaptivity with oscillating coefficient field. As an alternative to Monte Carlo methods, we investigate methods which exploit the equivalence of PDEs with random data and stochastic differential equations (Feynman-Kac). Such highly parallelizable approaches typically require the reconstruction of a global solution representation. However, they allow for a complete separate and local control of all discretization parameters. To be more specific, pointwise solution realizations in the physical domain are determined by some appropriate numerical method (Euler-Maruyama). Subsequently these are either used for a global or local polynomial regression or an interpolation on a mesh. Regression approach for the pointwise solution of an SDE equivalent to the random PDE. A simulation based method for the numerical solution of PDE with random coefficients is presented. By the Feynman-Kac formula, the solution can be represented as conditional expectation of a functional of a corresponding stochastic differential equation driven by independent noise. A time discretization of the SDE for a set of points in the domain and a subsequent Monte Carlo regression lead to an approximation of the global solution of the random PDE. We provide an initial error and complexity analysis of the proposed method along with numerical examples illustrating its behaviour. A numerical method for the fully adaptive sampling and interpolation of PDE with random data is presented. It is based on the idea that the solution of the PDE with stochastic data can be represented as conditional expectation of a functional of a corresponding stochastic differential equation (SDE). The physical domain is decomposed subject to a non-uniform grid and a classical Euler scheme is employed to approximately solve the SDE at grid vertices. Interpolation with a conforming finite element basis is employed to reconstruct a global solution of the problem. An a posteriori error estimator is introduced which provides a measure of the different error contributions. This facilitates the formulation of an adaptive algorithm to control the overall error by either reducing the stochastic error by locally evaluating more samples, or the approximation error by locally refining the underlying mesh. Numerical examples illustrate the performance of the presented novel method. The solution of PDE with stochastic data commonly leads to very high-dimensional algebraic problems, e.g. when multiplicative noise is present. The Stochastic Galerkin FEM considered in this paper then suffers from the curse of dimensionality. This is directly related to the number of random variables required for an adequate representation of the random fields included in the PDE. With the presented new approach, we circumvent this major complexity obstacle by combining two highly efficient model reduction strategies, namely a modern low-rank tensor representation in the tensor train format of the problem and a refinement algorithm on the basis of a posteriori error estimates to adaptively adjust the different employed discretizations. The adaptive adjustment includes the refinement of the FE mesh based on a residual estimator, the problem-adapted stochastic discretization in anisotropic Legendre Wiener chaos and the successive increase of the tensor rank. Computable a posteriori error estimators are derived for all error terms emanating from the discretizations and the iterative solution with a preconditioned ALS scheme of the problem. Strikingly, it is possible to exploit the tensor structure of the problem to evaluate all error terms very efficiently. A set of benchmark problems illustrates the performance of the adaptive algorithm with higher-order FE. Moreover, the influence of the tensor rank on the approximation quality is investigated. F. Lanzara, V. Maz'ya, G. Schmidt, A fast solution method for time dependent multidimensional Schrödinger equations, Applicable Analysis. An International Journal, published online on 08.08.2017, urlhttps://doi.org/10.1080/00036811.2017.1359571, DOI 10.1080/00036811.2017.1359571 . Chance constraints represent a popular tool for finding decisions that enforce a robust satisfaction of random inequality systems in terms of probability. They are widely used in optimization problems subject to uncertain parameters as they arise in many engineering applications. Most structural results of chance constraints (e.g., closedness, convexity, Lipschitz continuity, differentiability etc.) have been formulated in a finite-dimensional setting. The aim of this paper is to generalize some of these well-known semi-continuity and convexity properties to a setting of control problems subject to (uniform) state chance constraints. The focus of this work is the introduction of some computable a posteriori error control to the popular multilevel Monte Carlo sampling for PDE with stochastic data. We are especially interested in applications in the geosciences such as groundwater flow with rather rough stochastic fields for the conductive permeability. With a spatial discretisation based on finite elements, a goal functional is defined which encodes the quantity of interest. The devised goal-oriented error estimator enables to determine guaranteed a posteriori error bounds for this quantity. In particular, it allows for the adaptive refinement of the mesh hierarchy used in the multilevel Monte Carlo simulation. In addition to controlling the deterministic error, we also suggest how to treat the stochastic error in probability. Numerical experiments illustrate the performance of the presented adaptive algorithm for a posteriori error control in multilevel Monte Carlo methods. These include a localised goal with problem-adapted meshes and a slit domain example. The latter demonstrates the refinement of regions with low solution regularity based on an inexpensive explicit error estimator in the multilevel algorithm. Equilibration error estimators have been shown to commonly lead to very accurate guaranteed error bounds in the a posteriori error control of finite element methods for second order elliptic equations. Here, we extend previous results by the design of equilibrated fluxes for higher-order finite element methods with nonconstant coefficients and illustrate the favourable performance of different variants of the error estimator within two deterministic benchmark settings. After the introduction of the respective parametric problem with stochastic coefficients and the stochastic Galerkin FEM discretisation, a novel a posteriori error estimator for the stochastic error in the energy norm is devised. The error estimation is based on the stochastic residual and its decomposition into approximation residuals and a truncation error of the stochastic discretisation. Importantly, by using the derived deterministic equilibration techniques for the approximation residuals, the computable error bound is guaranteed for the considered class of problems. An adaptive algorithm allows the simultaneous refinement of the deterministic mesh and the stochastic discretisation in anisotropic Legendre polynomial chaos. Several stochastic benchmark problems illustrate the efficiency of the adaptive process. 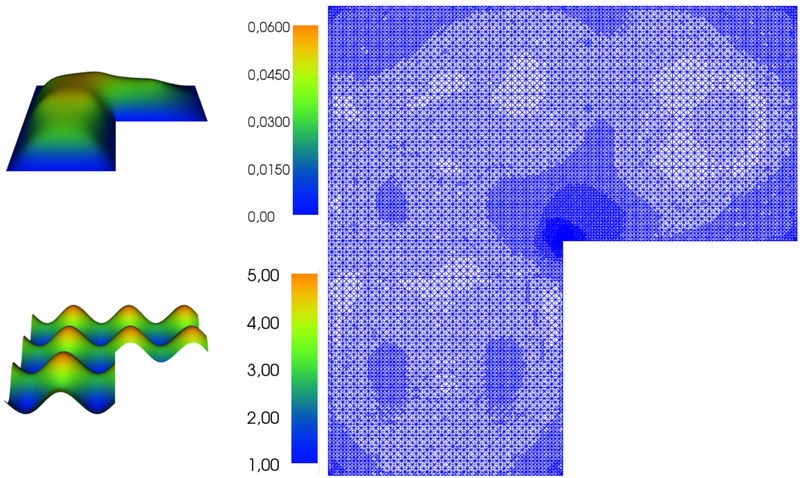 We analyze a-posteriori error estimation and adaptive refinement algorithms for stochastic Galerkin Finite Element methods for countably-parametric elliptic boundary value problems. A residual error estimator which separates the effects of gpc-Galerkin discretization in parameter space and of the Finite Element discretization in physical space in energy norm is established. It is proved that the adaptive algorithm converges, and to this end we establish a contraction property satisfied by its iterates. It is shown that the sequences of triangulations which are produced by the algorithm in the FE discretization of the active gpc coefficients are asymptotically optimal. Numerical experiments illustrate the theoretical results. In silico experiments bear the potential to further the understanding of biological transport processes by allowing a systematic modification of any spatial property and providing immediate simulation results for the chosen models. We consider cell polarization and spatial reorganization of membrane proteins which are fundamental for cell division, chemotaxis and morphogenesis. Our computational study is motivated by mating and budding processes of S. cerevisiae. In these processes a key player during the initial phase of polarization is the GTPase Cdc42 which occurs in an active membrane-bound form and an inactive cytosolic form. We use partial differential equations to describe the membrane-cytosol shuttling of Cdc42 during budding as well as mating of yeast. The membrane is modeled as a thin layer that only allows lateral diffusion and the cytosol is modeled as a volume. We investigate how cell shape and diffusion barriers like septin structures or bud scars influence Cdc42 cluster formation and subsequent polarization of the yeast cell. Since the details of the binding kinetics of cytosolic proteins to the membrane are still controversial, we employ two conceptual models which assume different binding kinetics. An extensive set of in silico experiments with different modeling hypotheses illustrate the qualitative dependence of cell polarization on local membrane curvature, cell size and inhomogeneities on the membrane and in the cytosol. We examine that spatial inhomogenities essentially determine the location of Cdc42 cluster formation and spatial properties are crucial for the realistic description of the polarization process in cells. In particular, our computer simulations suggest that diffusion barriers are essential for the yeast cell to grow a protrusion. M. Eigel, C. Gittelson, Ch. Schwab, E. Zander, Adaptive stochastic Galerkin FEM, Computer Methods in Applied Mechanics and Engineering, 270 (2014), pp. 247--269. F. Lanzara, V. Maz'ya, G. Schmidt, Fast cubature of volume potentials over rectangular domains by approximate approximations, Applied and Computational Harmonic Analysis. Time-Frequency and Time-Scale Analysis, Wavelets, Numerical Algorithms, and Applications, 36 (2014), pp. 167--182. In the present paper we study high-order cubature formulas for the computation of advection-diffusion potentials over boxes. By using the basis functions introduced in the theory of approximate approximations, the cubature of a potential is reduced to the quadrature of one dimensional integrals. For densities with separated approximation, we derive a tensor product representation of the integral operator which admits efficient cubature procedures in very high dimensions. Numerical tests show that these formulas are accurate and provide approximation of order O(h6) up to dimension 108. In this survey chapter we give an overview of recent applications of the splitting method to stochastic (partial) differential equations, that is, differential equations that evolve under the influence of noise. We discuss weak and strong approximations schemes. The applications range from the management of risk, financial engineering, optimal control and nonlinear filtering to the viscosity theory of nonlinear SPDEs. M. Eigel, A sampling-free adaptive Bayesian inversion with hierarchical tensor representations, European Conference on Numerical Mathematics and Advanced Applications (ENUMATH 2017), Minisymposium 15 ``Uncertainty Propagation'', September 25 - 29, 2017, Voss, Norway, September 27, 2017. M. Eigel, Adaptive stochastic Galerkin FE and tensor compression for random PDEs, sc Matheon Workshop ``Reliable Methods of Mathematical Modeling'' (RMMM8), July 31 - August 4, 2017, Humboldt-Universität zu Berlin, August 3, 2017. M. Eigel, Aspects of stochastic Galerkin FEM, Universität Basel, Mathematisches Institut, Switzerland, November 10, 2017. M. Eigel, Efficient Bayesian inversion with hierarchical tensor representation, 2nd International Conference on Uncertainty Quantification in Computational Sciences and Engineering (UNCECOMP 2017), June 15 - 17, 2017, Rhodos, Greece, June 16, 2017. M. Eigel, Explicit Bayesian inversion in hierarchical tensor representations, 4th GAMM Junior's and 1st GRK2075 Summer School 2017 ``Bayesian Inference: Probabilistic Way of Learning from Data'', July 10 - 14, 2017, Braunschweig, July 14, 2017. M. Eigel, Stochastic topology optimization with hierarchical tensor reconstruction, Frontiers of Uncertainty Quantification in Engineering (FrontUQ 2017), September 6 - 8, 2017, München, September 7, 2017. M. Eigel, Adaptive stochastic Galerkin FEM with hierarchical tensor representations, Advances in Uncertainty Quantification Methods, Algorithms and Applications (UQAW 2016), January 5 - 10, 2016, King Abdullah University of Science and Technology (KAUST), Thuwal, Saudi Arabia, January 8, 2016. M. Eigel, Adaptive stochastic Galerkin FEM with hierarchical tensor representations, 15th Conference on the Mathematics of Finite Elements and Applications (Brunel MAFELAP 2016), Minisymposium ``Uncertainty Quantification Using Stochastic PDEs and Finite Elements'', June 14 - 17, 2016, Brunel University London, Uxbridge, UK, June 14, 2016. M. Eigel, Adaptive stochastic Galerkin FEM with hierarchical tensor representations, Joint Annual Meeting of DMV and GAMM, Section 18 ``Numerical Methods of Differential Equations'', March 7 - 11, 2016, Technische Universität Braunschweig, March 10, 2016. M. Eigel, Some aspects of adaptive random PDEs, Oberseminar, Rheinisch-Westfälische Technische Hochschule Aachen, Institut für Geometrie und Praktische Mathematik, July 21, 2016. J. Neumann, Adaptive SDE based sampling for random PDE, SIAM Conference on Uncertainty Quantification, Minisymposium 142 ``Error Estimation and Adaptive Methods for Uncertainty Quantification in Computational Sciences -- Part II'', April 5 - 8, 2016, Lausanne, Switzerland, April 8, 2016. J. Pellerin, RINGMesh: A programming library for geological model meshes, The 17th annual conference of the International Association for Mathematical Geosciences, September 5 - 13, 2015, Freiberg, September 8, 2015. M. Eigel, Adaptive stochastic Galerkin FEM with hierarchical tensor representations, 2nd GAMM AGUQ Workshop on Uncertainty Quantification, September 10 - 11, 2015, Chemnitz, September 10, 2015. 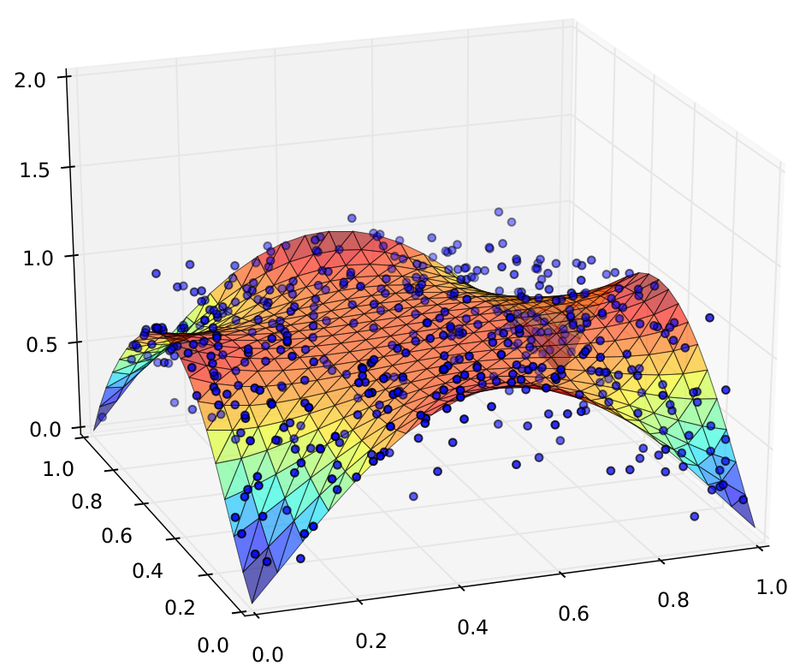 M. Eigel, Fully adaptive higher-order stochastic Galerkin FEM in low-rank tensor representation, International Conference on Scientific Computation And Differential Equations (SciCADE 2015), September 14 - 18, 2015, Universität Potsdam, September 15, 2015. M. Eigel, Guaranteed error bounds for adaptive stochastic Galerkin FEM, Technische Universität Braunschweig, Institut für Wissenschaftliches Rechnen, April 1, 2015. M. Eigel, Stochastic adaptive FEM, Forschungsseminar Numerische Mathematik, Humboldt-Universität zu Berlin, Institut für Mathematik, January 28, 2015. CH. Bayer, SDE based regression for random PDEs, Direct and Inverse Problems for PDEs with Random Coefficients, WIAS Berlin, November 13, 2015. M. Eigel, A posteriori error control in stochastic FEM and MLMC, 27th Chemnitz FEM Symposium 2014, September 22 - 24, 2014, September 24, 2014. M. Eigel, Adaptive spectral methods for stochastic optimisation problems, Technische Universität Berlin, Institut für Mathematik, May 22, 2014. M. Eigel, Adaptive stochastic FEM, Universität Heidelberg, Interdisziplinäres Zentrum für Wissenschaftliches Rechnen (IWR), June 5, 2014. M. Eigel, Guaranteed a posteriori error control with adaptive stochastic Galerkin FEM, SIAM Conference on Uncertainty Quantification (UQ14), March 31 - April 3, 2014, Savannah, USA, April 1, 2014. M. Ladkau, Brownian motion approach for spatial PDEs with stochastic data, International Workshop ``Advances in Optimization and Statistics'', May 15 - 16, 2014, Russian Academy of Sciences, Institute of Information Transmission Problems (Kharkevich Institute), Moscow, May 16, 2014. J. Neumann, A posteriori error estimators for problems with uncertain data, Norddeutsches Kolloquium über Angewandte Analysis und Numerische Mathematik (NoKo), Christian-Albrechts-Universität zu Kiel, May 10, 2014. J. Neumann, Stochastic bounds for quantities of interest in groundwater flow with uncertain data, Université Paris-Sud, Laboratoire d'Analyse Numérique, Orsay, France, October 9, 2014.